But the vision for truck video systems goes beyond one-time accident claims to creating more efficient, less risky fleets. (This article has been amended to reflect that KeepTruckin’s camera product has been available since June and that Progressive offers savings for sharing KeepTruckin’s ELD data, but not its camera product. Major commercial vehicle insurers are pushing for a broader roll-out of video technology in commercial vehicles, using the carrots of lower premiums and claims costs for fleet owners. Beyond just safety, though, companies in the space see video cameras as an increasingly important analysis tool for fleets to improve their efficiency. Market penetration of in-cab cameras is still relatively small. Adam McCarty, vice president at San Diego-based video and telematics company Lytx, says the company’s cameras are in 500,000 of the 20 million to 30 million commercial vehicles on the road. Major insurers, though, are now getting behind those products. Nationwide, one of roughly 20 insurers Lytx works with, now offers commercial vehicle customers discounts for installing video cameras. The new offering comes as road fatalities are set to rise 5% this year, Nationwide said. 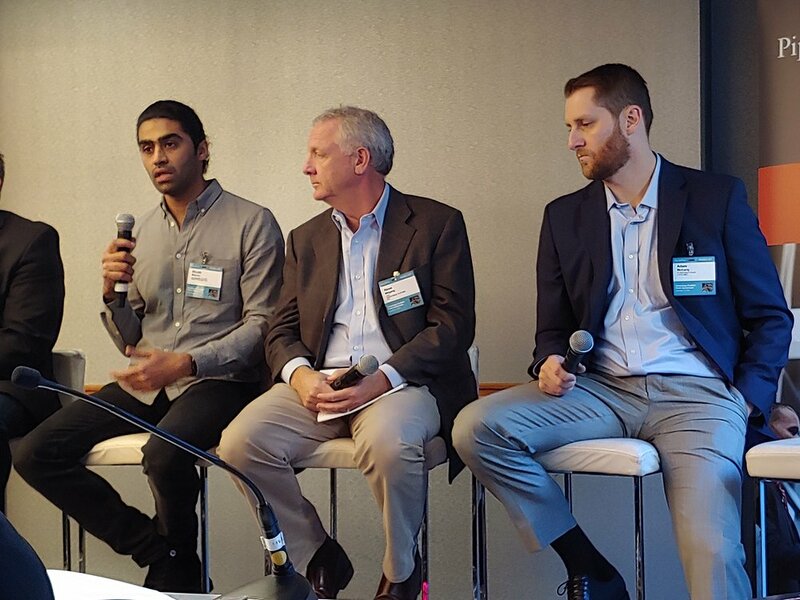 Speaking at a fleet technology forum sponsored by Piper Jaffray, Adam McCarty, vice president at Lytx, says with commercial vehicle premiums running well over $10,000 per year, the discounts offset the cost of installing camera technology. The fleet “gets the cost of video subsidized by the insurance company, and the insurer gets better data for decision making,” McCarty said. Electronic logging device maker KeepTruckin introduced an in-cab video service back in June. Chief executive Shoaib Makani says the San Francisco-based company has signed up “tens of thousands” of its roughly 500,000 ELD customers for its video product offering. Makani says Progressive (NYSE: PGR) is offering discounts on commercial insurance premiums for fleets that share data from KeepTruckin’s ELD product. He says the next step is to get other insurers to offer savings when fleets share video through KeepTruckin’s camera product . SmartDrive Systems chief executive Steve Mitgang, whose cameras are in some 250,000 trucks, says the average liability claim in a commercial vehicle accident is around $5,000. But personal injury and other claims can push that figure well past $15,000. Driver reaction to video cameras, particularly driver-facing ones, is a hurdle. But more fleets are looking at the technology for the cost savings. Fleet owners have “lawyers telling them you are making a mistake if you don’t have cameras,” Mitgang said. “There’s always fear of driver pushback, but you have a lot more people adopting it,” he said. Dan Deppeler, vice president at Paper Transport, says the Wisconsin-based carrier saw about 15% turnover related to the initial roll out of in-cab cameras in its 800 power units. But the savings in the insurance and liability costs was worth it. “We had a few drivers that left for the sheer fact that cameras were in there,” Deppeler said. “We’d rather they leave if that’s their deepest concern and have them drive for someone else. “It’s tough to grow your business, but we viewed it as acceptable turnover,” he added. “They want camera systems to monitor both what’s happening on the road and what’s happening in the vehicle,” Walker said. Adam Kahn, vice president at Netradyne, says the key step is using video systems to also recognize good driving behavior, along with accident prevention. He says one customer roll-out allows drivers to review their driving videos, with the result being further improvements in driver safety. “Those are important because buy-in starts at the driver level,” Kahn said. Outside of use in recording accidents, video technology companies are pitching cameras as a tool for owners to better understand their fleets and drive more efficiency overall. Lytx says its cameras capture one billion road miles of every ten days. Those videos can then be used to provide more information to fleet owners about different highway conditions. “We start to find out things like where the riskiest place to drive in California is, or distracted driving rises on I-5 between Bakersfield and Sacramento,” McCarty said. Of course, wrangling hours of video is a challenge. Most of the companies are looking to machine learning and other high-tech tools that help review footage easily for specific information about driver and vehicle behavior. KeepTruckn’s Makani says the company’s recent hires aim to boost the company’s machine learning expertise for reviewing video to assess both how vehicles and drivers perform under different circumstances. Similarly, the company is looking at building out a street view style map to help fleets maneuver warehouses and distribution centers. “It reduces the incidence of having to make risky maneuvers like u-turns,” Makani said. Outside of company-specific data, fleets can also benefit from sharing data, albeit anonymously. Netradyne’s Kahn says one U.S. Midwest-based fleet was able to get a better view of its risk through seeing anonymized data about other truck movements.